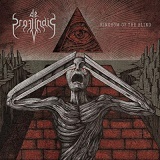 It can be said that UK metallers De Profundis play melodic death metal, but that would be treating Kingdom of the Blind extremely short. Even though in general the genre description pertains, the last thing this album can be thought of is melodic death of straight Gothenburg variety. A brief research into De Profundis history shows that the band wasn’t always pursuing progressive angles with their extreme metal, and started out in the doom realm. Yet the previous EP release Frequencies and now Kingdom of the Blind cement the band firmly proceeding down the progressive death metal path. Maybe it is an overreach, but I would like to compare Kingdom of the Blind to what iconic Death were doing on their last two albums, when the late Chuck Schuldiner smashed barriers and brought in various influences into Death brand of death metal. I am raising this comparison because De Profundis are excellent instrumentalists and demonstrate intricate involved songwriting throughout the album. This is one of those releases where I just feel intrigued, even if I don't outright love every single note. Kingdom of the Blind is absolutely not a chore to listen to, and you will have a strange draw to put it on repeatedly to see if you missed a cool moment or two from a previous spin. The album just makes you think, not yielding all of its secrets, nooks and crannies after just one quick glance. At first I felt that De Profundis are playing on Kingdom of the Blind in a reserved fashion, with somewhat suppressed emotions. Linear monotonous low timbre growl by Craig Land helped this impression. But then constant sense of exploration expressed on this album completely won me over. Not done by the blueprint, the brooding melodies, although not always on the surface, come through and set the mood whether they are sad opening lead (Kingdoms of the Blind) or twisted lengthy solos the album is full of. The album is also replete with unusual time signatures and off kilter beats (Kult of the Orthodox), or intentional rhythmic stumbles (Beyond the Threshold). You will never be able to nail down as to where the compositions are going on Kingdom of the Blind. Beyond the Threshold begins with more straightforward spine-straightening double bass after all of the delectable looseness preceding it, and A Strange Awakening is probably the most melodic with layered dual guitars after being outright blasting brutal in the beginning. The final touch of coolness, the proverbial cherry on top, is De Profundis using jazz interludes, whether they are quick inserts (Beyond the Threshold), full blown passages (All Consuming) or just the rhythms and atmosphere (Kult of the Orthodox). I guess you don’t even dare going in that direction unless you are confident with your song craft or playing abilities. The rhythm section deserves special mention, while guitar sound production is also very forward without being grating or obnoxious. When you can play so well, you might as well showcase it. If you are tired from tried and true, mundane and usual, and in the mood for a rewarding but challenging listen, Kingdom of the Blind delivers just that.